Approaches have been grouped by intersection. The Albany Police Department released the latest bunch of numbers from the city's red light camera system this week. And for the months of October, November, and December of 2015 the system registered almost 2,900 violations across 25 intersection approaches. We've sifted and sorted the numbers in some easy-scan tables -- and a map. This intersection just of Central Ave continued to rack up large numbers of violations -- 653 in total during the fourth quarter of last year. It was also a top spot in the last batch of numbers. It's kind of surprising to us how few violations were captured at Washington & Quail and Washington & Main. We would have figured those spots might have the same issues as that stretch of Western mentioned above -- wide street with people traveling along it quickly. But the spots had the lowest number of violations captured among active camera intersections. 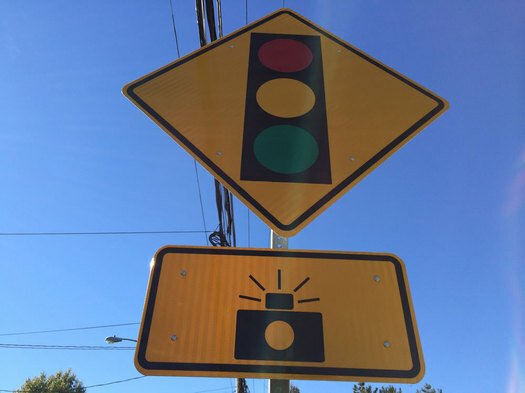 Based on the experience of other cities, one of the side effects of red light camera is said to sometimes be an uptick in the number of rear-end crashes. Albany police say there were 16 rear-end crashes near camera intersections during the last quarter of 2015 -- and a review of those crashes determined that one of the 16 could be attributed to behavior prompted by the red light camera. One of the things we'd like to know along with these violation numbers: How many cars are passing through an intersection or approach. Knowing the volume of traffic would help put violation numbers in a better context. The violations on Western Avenue which you mention are particularly disturbing because they are in a school zone. Presumably the speed limit during the school day is reduced to 20 mph and yet still drivers are blowing through those lights. Even if every camera caught as many red light runners as the one at Everett Rd, we would need ~112 cameras to generate the revenue that was projected. This also assumes that people don't learn and stop running red lights! Am I getting something wrong here, or was the +$2M assumption in the budget way off base? Moment of truth is coming soon. Either this is about safety - and then city will start paying company after contract is renegotiated; or this is about revenue - then traffic light cycle will be adjusted to increase number of issued tickets. My bet is #2, and damn that stupid safety thing. Instead of writing a thoughtful thinkpiece about the red light cameras, have a professional traffic engineer sift through the data and have them give you an educated opinion. Also, none of the data means anything without the traffic lights timed to traffic conditions. Mike, if it turned out to be #2, I'd be totally okay with that. As I've said many times, we could use the revenue, and there are few better sources for it than those who endanger others. Andy, all of the yellows at these intersections were extended by one second. If you can't stop in that time, you are speeding and absolutely no consideration whatsoever should be given to you. > all of the yellows at these intersections were extended by one second. No they were not. State DOT "standard" (more like a common practice) for yellow light is 3.9 seconds. Those with red light cameras were said to last "4 seconds" not 5. I forgot that the # of tickets was only for Q4, so we would only need 28 cameras working at the Everett/Wavervliet camera pace to generate $3.68M. Lu, every article I've read indicated they were extending the yellow lights. If not, that's fine too. If you don't have time to stop, you were speeding and you deserve a ticket, not accommodation. And regarding your "Welcome to Albany" quip, if you can't come to Albany without endangering us, you're not welcome. JayK, I think you're missing the point. The fear is that if the traffic cameras don't bring in the expected revenue, yellow light times would be set *artificially low*; that is, shorter than the standard time, and possibly dangerously so. If someone who is obeying the speed limit still can't stop in time to avoid a fast red light and/or has to worry about getting rear-ended, that's a problem. It's issues like this that have led to red-light cameras being removed all over the nation at the same time Albany hops on the bandwagon. However, I believe you're right about the promise to extend the yellow duration. I don't recall offhand whether the lights in question were already on the short side, so that doing this would bring them more in line with the "standard". As long as the usage of the cameras is on the up-and-up, I have no problem with them. It's when the cities that have them find the need to tweak the lights such that criminals are being created out of thin air and safety is being jeopardized all to make a quick buck that people get their hackles up. Tim, we're in agreement generally. My opinion is that even if these are on the short side (say three seconds), it's still extremely easy to stop for them. That said, at the very least the city is not shortening red lights. Not only would that be potentially dangerous in itself, but as you also mentioned, can be a reason for these systems to be removed. As a supporter of the system, keeping it on the up and up is essential to keeping and improving it. Too bad Madison and South Lake just missed getting a red light camera. This corner has had several accidents in the past year. People are always driving through the red lights. Until we see that the cars have actually stopped, we pause before driving forward at this intersection. We have had some near misses before we started doing this.